Please contact us with the contact form to report difficulties, strange behaviors or persistent problems, and quote the program name or the number 15771 . 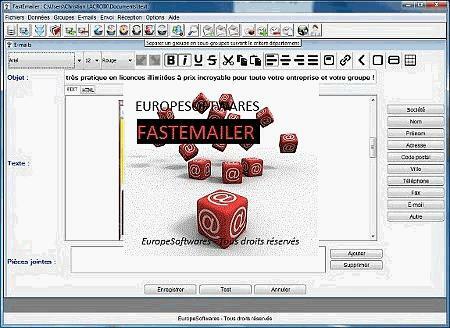 This is the download page for Fastemailer - FastEmailer is a simple and professional software, accessible to all to achieve campaigns of emailing from any address SMTP. Import your data of a directory in a group, to create some subgroups according to the city, department, of the postal code or by number or alphabetically. To create your mail in format text or html with pictures, ties or of the attached pieces and to throw the mailing. Ideal for the prospecting, the newsletters, the promotional offers or the invitations or raises! 1000 mails / hour about!